Most voters disapprove of the once-popular Democratic incumbent after his corruption trial. Could Trump be his unlikely savior? 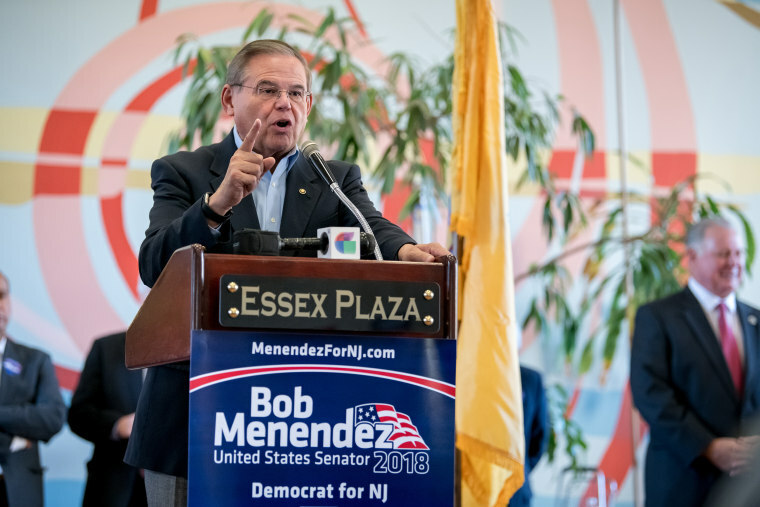 NEWARK, N.J. — At a recent campaign event inside a Latino community center, Democratic Sen. Bob Menendez urged voters to consider what's at stake in his race for re-election: the economy, health care, entitlements. One key issue didn't make the list: himself. "This election is not about me," he told the crowd. "It's about you and our country." Not exactly. New Jersey residents, in poll after poll, have expressed concern about the incumbent lawmaker, who escaped a verdict when his federal corruption trial ended in a mistrial last year. Dragged down by sky-high disapproval ratings, Menendez faces a close race to secure a third term in a state that hasn't elected a Republican to the U.S. Senate since 1972. But while Menendez is dogged by ethics questions, his Republican challenger, Bob Hugin, a Marine Corps veteran and the former chief of a biopharmaceutical behemoth who has spent millions of his own money pummeling Menendez with negative ads, has a potentially bigger problem: President Donald Trump, who remains deeply unpopular in the blue state. "Certainly, the corruption accusations, even if they were dismissed, are out there in a big way, and they have been reinforced by the Hugin advertising juggernaut," said Ben Dworkin, the director of the Institute for Public Policy and Citizenship at Rowan University, in Glassboro, N.J. "That's sure to make a difference in how people view Bob Menendez." Menendez, who was accused of accepting gifts from a convicted Florida ophthalmologist in exchange for advocating for his business interests, was later "severely admonished" by the Senate Ethics Committee. Nearly a year later, voters haven't forgotten. Several polls show spiking levels of disapproval for the senator — who won re-election six years ago by nearly 20 percentage points — with the charges of corruption weighing him down heavily. A Stockton University poll out earlier this month showed Menendez leading Hugin among likely voters 45 percent to 43 percent. It found 54 percent of likely voters viewed Menendez unfavorably, versus 30 percent who viewed him favorably, and nearly 60 percent of respondents said the corruption charges against Menendez were an "extremely important or significant factor" in their vote. Similarly, a Quinnipiac University poll released Wednesday showed Menendez leading Hugin among likely New Jersey voters 51 percent to 44 percent, with 52 percent of respondents saying they had an unfavorable view of Menendez, compared with 36 percent who said they viewed him favorably. And on Thursday, Monmouth University released a poll found "corruption in government" was the second-most important issue in the race, behind health care. Menendez, 63, has hit back hard at Hugin with his own negative ads about Hugin's time as chief executive of Celgene, and he has also sought to staple Hugin to Trump. "There's a big difference between fighting for the people of New Jersey … and someone who stands with Trump," Menendez told NBC News in a recent interview. "He stands with Donald Trump foursquare. I've opposed Donald Trump." But Menendez just hasn't been able to keep up with Hugin's spending. Hugin lent his campaign $24 million of his own money, and as of Sept. 30, had already spent about $23 million, according to FEC filings, largely on television ads. In comparison, Menendez raised about $11 million and, as of Sept. 30, had spent about $7 million, according to filings. Last week, a major Democratic super PAC, Senate Majority PAC, said it would spend $3 million to boost Menendez to help make up the difference. Hugin, for his part, has been trying to keep his distance from the president, who polls show is unpopular in the state. "This race is Bob Hugin versus Bob Menendez," he told NBC News in a recent interview. "This is a New Jersey race." "I'll stand up to anybody,” Hugin added, nodding his head when asked if that included Trump. The 64-year-old Marine Corps veteran supports gay marriage and LGBTQ and abortion rights, an attractive resume for a Republican in New Jersey, where registered Democrats outnumber registered Republicans by more than 900,000. But while Hugin has on several occasions spoken out publicly against Trump administration policies, he was also the financial chair of Trump’s 2016 New Jersey campaign, donated to his campaign and served as a delegate for the 2016 Republican National Convention. And that could be just enough for Menendez, whose race is still rated by the Cook Political Report as "Lean Democratic"